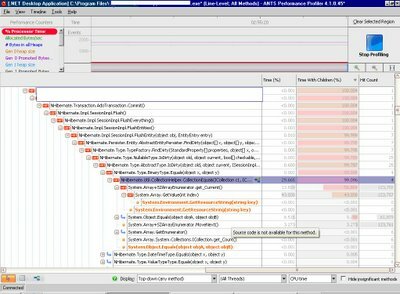 This is a curious case that led me to discover and use a very valuable tool ANTS Profiler and read a few good blogs about .NET debugging and CLR internals. Read on to bookmark with me. Near to Christmas we received a complain one of the windows applications was performing too slow after a few hours of usage. 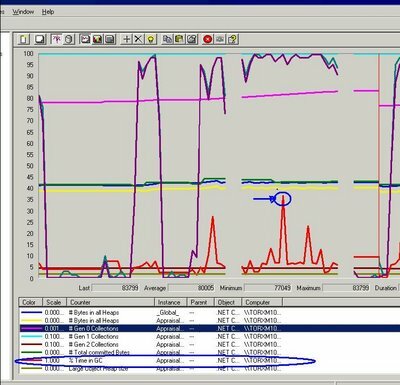 Performance monitor counters indicated the performance problem lied on high CPU peaks sustained for a long period of time. First thing that came to our mind was an infinite loop, however the curious part on this case is that the CPU peaks took longer the longer the end user worked on the application and began to be noticeable after a couple of hours, not quite the definition of an infinite loop. First we grabbed the free debugging tools (insert the obvious reasons here, budget, management approval, etc): CLRProfiler, winDGB, SOS and ADPlus. Two great blog posts about how to start with these tools can be found here (Speaking Of Which) and here (Maoni’s blog). 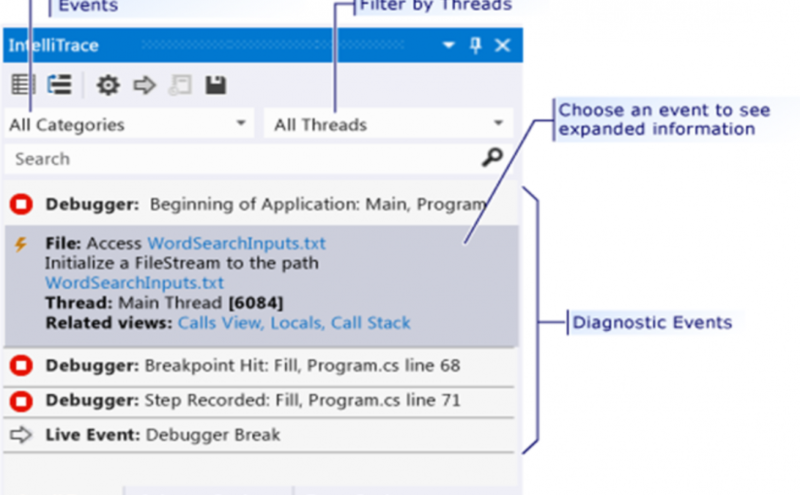 MSDN Magazine also has two good articles (Bugslayer column and this CLR Inside Out column) on the subject of windows debugging tools and how to use them in VS 2005. 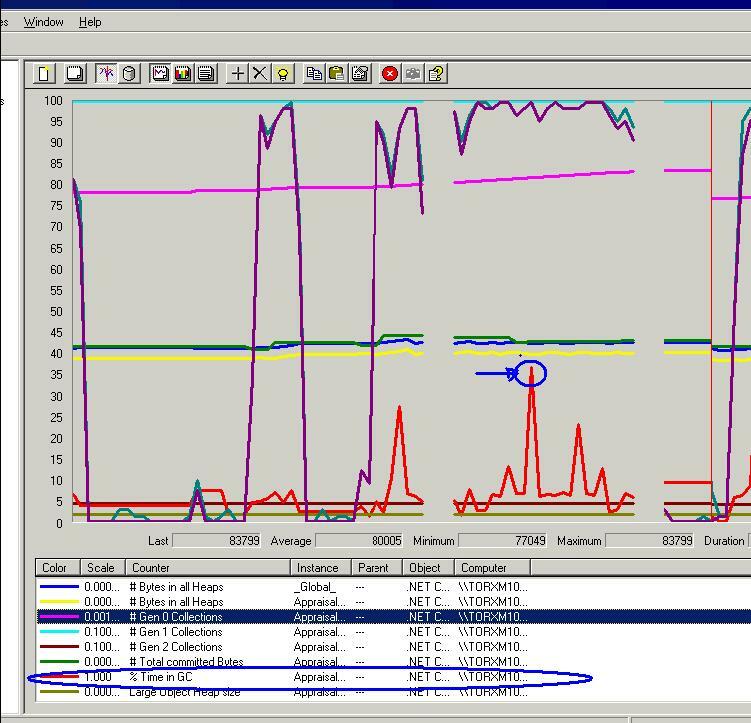 Back to our own experience on the matter, CLRProfiler hung the machine beyond response and despite being able to sketch the object graph in memory, it was hard to correlate the time of the high CPU peaks with the information obtained from CLRProfiler. This was not due to a problem with the tool itself, hanging was due to poor iron power and our over-consuming application and the inability to detect the main CPU usage cause was due to the fact that CLR profiler is only meant to identify and isolate problems related with garbage collection, excessive long lived objects or huge collections. At first we thought the high CPU could be related with garbage collection due to long lived objects, see this post on Tess’s blog If broken it is, fix it you should. 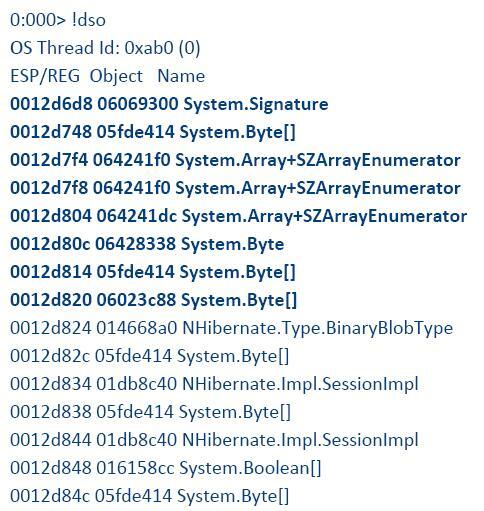 We collected memory dumps with ADPlus during the high CPU peaks as per this lab blog post and analyzed the memory dumps using WinDBG. At the end we decided to have more control on when the dumps were taken and use WinDBG while attaching it to the process. I should also mentioned ADPlus ended up generating dumps with errors when the system was really stressed. 2. 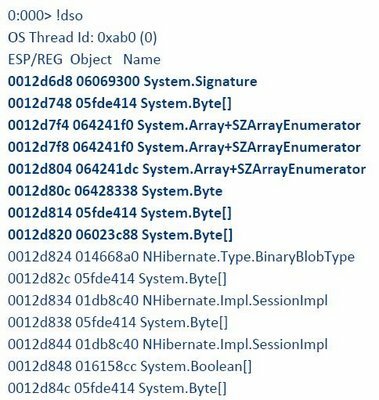 Open up WinDBG. Click on File ?> Attach To Process ?> Select the process ?> Click on OK. This will take a dump. 5. Press ‘g’ and hit enter for the process to resume. WinDBG can give valuable information about the CLR stack at the time the dump was collected (clrstack command), the types being scheduled for GC (!finalizequeue) and how many types marked for finalization belong to Gen 0, Gen 1 and Gen2. Seeing your managed stack at a single point in time or having exact information about the memory allocation does not give information on the amount/% of CPU time each method takes though. We tried taking dumps with WinDbg at the beginning of the CPU peak, in the middle and at the end but the results only offered a hint, too many Collections were allocated and lived to Gen 2. Some of this collections were byte arrays. It wasn’t apparent from analyzing the three managed stacks (from the three memory dumps) which method was consuming the longest time. So far we had lots of collections surviving to Generation 2 and some of them were of type byte array. Garbage collection counters, however were within the “normal”. If the application was just “busy” doing its stuff, where was this time spent? Data Binding? Event Brokerage? Database access latency and query performance had been already discarded with SQL Profiler btw. The main sustained CPU peak cause was discovered using ANTS profiler. Memory leaks, long GC cycles were discarded using the mentioned free tools. 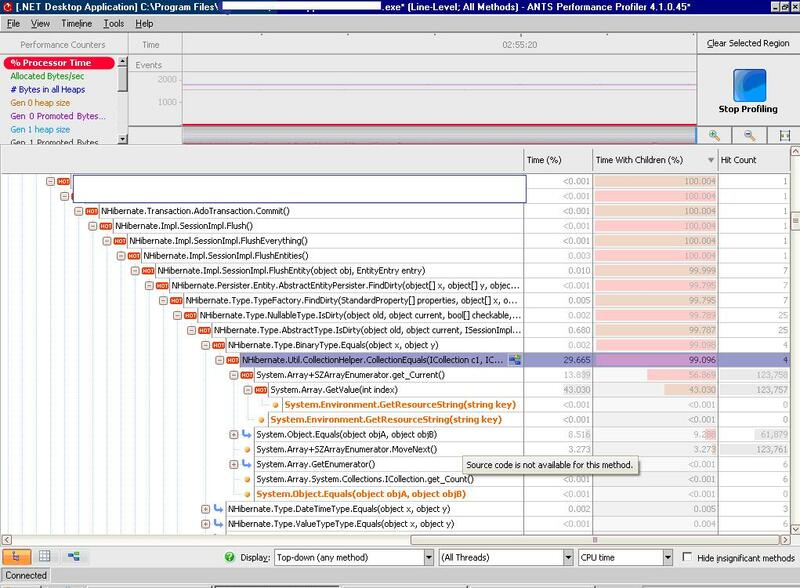 ANTS profiler will let you set .NET performance counters and it will attach itself to the application being debugged. You cannot set breakpoints, afaik, but can go back in the profiler results and drag your cursor over a region to get a full called stack walk. It also goes beyond that and will indicate the % of time each method is taking on CPU and the % of time its children take on CPU usage. Finally! A tool that will correlate performance counters the called stack for you and will indicate % of CPU time per method. This information you cannot gather by taking memory snapshots or called stack snapshots, unfortunately the free tools were only useful to discard memory leaks and GC related problems on this particular case. They narrowed down the places to look into. 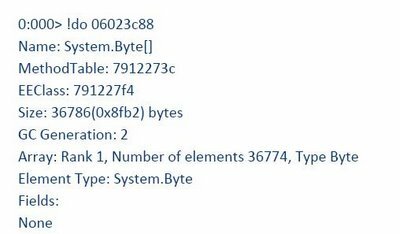 As you can see from the ANTS Profiler screen shot the application was indeed doing stuff, in this case comparing collections of bytes, byte per byte…Ouch! and changed our mapping attributes to indicate there was no need to update the BinaryBlob fields. Our application either inserts the binary data or deletes its. Note: you should be logged into http://jira.nhibernate.org/ before navigating to this bug report, registration is free. I hope this post hasn’t turned out too long, by upgrading NHibernate we solved the mystery of performance downgrade over time, the more the user worked with persistent binary data in the application the longer this loop comparing byte per byte on each collection took. Upgrading NHibernate added to a performance challenge in another area, the application start up was taking longer. This will go on Part II as I should get some sleep. It just doesn’t make sense that in order to add up functionality to the 2.0 framework without touching the runtime, yet another framework version is created and deployed in a different folder. It is extremely confusing as to what will be the implications. Let’s say I have an existing 2.0 application and I want to take advantage of the WinFX in order to add/implement workflows. Do I have first to start worrying about how to migrate my current application from 2.0 to 3.0 or the classes we currently use from the 2.0 framework are still valid under the 3.0, amen of the new WinFX additions. Why not just adding a new namespace and new assembly for this piece, if it is dependent on the 2.0 framework but won’t replace it???? Migrating from 1.0 to 1.1 caused some pain, more pain (necessary evil IMHO) to migrate from 1.1 to 2.0. Do we have another migration at sight, or it would be just an add up? It would be worth to have an article published on MSDN about the cause of this decision.